Pictured: Carlie Marie Trent and her uncle Gary Simpson. 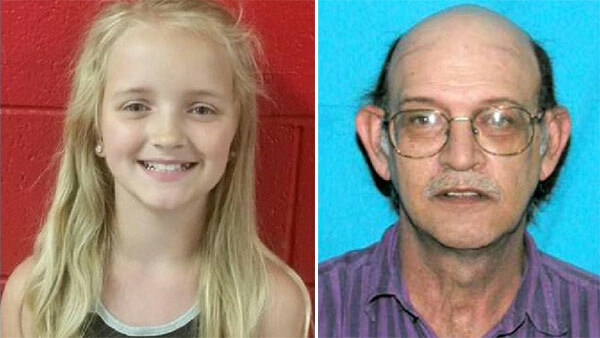 ROGERSVILLE, Tenn. -- A 9-year-old girl abducted more than a week ago when her uncle signed her out of school was found safe, authorities said Thursday. Carlie Marie Trent was found in Hawkins County, the rural part of East Tennessee where she lives, Tennessee Bureau of Investigation spokeswoman Susan Niland said in an email. Her uncle, Gary Simpson, is in custody, Niland said. The bureau plans a news conference later Thursday to discuss Carlie's recovery, Niland said. Earlier Thursday, the TBI had added Simpson, 57, to its Top 10 Most Wanted list and warned that Carlie was in imminent danger. TBI spokesman Josh DeVine, speaking earlier in the day, would not say what led investigators to believe that that Carlie could be in trouble. "But suffice it to say, we have specific and credible information that leads us to believe she's in danger right now," he said. An arrest warrant had been issued for Simpson on a charge of especially aggravated kidnapping, DeVine said. Simpson is married to the sister of Carlie's father. The families live close to one another in rural Hawkins County. The uncle and his wife had custody of Carlie and her little sister while their father was jailed on drug charges, but the girls went back to live with their father in 2015, DeVine said. He said investigators have not been able to find any work history for Simpson. Police say Simpson took the child out of school on May 4. They believe he may have taken her to a remote area or to a campground based on surveillance video showing him stocking up on items from an area Wal-Mart including a bikini, two tubes of colored lip gloss, nail polish, an outdoor chair and a child's nightgown.